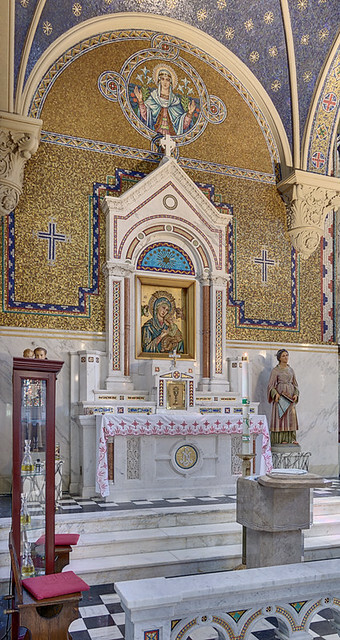 Altar with icon of Our Mother of Perpetual Help, at Saint Cecilia Church, in Saint Louis, Missouri. Photo taken in 2008. The picture of Our Lady of Perpetual Succour is painted on wood, with background of gold. It is Byzantine in style and is supposed to have been painted in the thirteenth century. It represents the Mother of God holding the Divine Child while the Archangels Michael and Gabriel present before Him the instruments of His Passion. Over the figures in the picture are some Greek letters which form the abbreviated words Mother of God, Jesus Christ, Archangel Michael, and Archangel Gabriel respectively. It was brought to Rome towards the end of the fifteenth century by a pious merchant, who, dying there, ordered by his will that the picture should be exposed in a church for public veneration. It was exposed in the church of San Matteo, Via Merulana, between St. Mary Major and St. John Lateran. Crowds flocked to this church, and for nearly three hundred years many graces were obtained through the intercession of the Blessed Virgin. The picture was then popularly called the Madonna di San Matteo. The church was served for a time by the Hermits of St. Augustine, who had sheltered their Irish brethren in their distress. These Augustinians were still in charge when the French invaded Rome (1812) and destroyed the church. The picture disappeared; it remained hidden and neglected for over forty years, but a series of providential circumstances between 1863 and 1865 led to its discovery in an oratory of the Augustinian Fathers at Santa Maria in Posterula. The original icon came from Crete, and has a long series of icons for its inspiration, and in turn has inspired uncountable copies and derivatives. According to tradition, the root of this artistic representation goes back to Saint Luke the Evangelist, who is said to have painted a portrait of the Blessed Virgin: this circular painting of Mary's face is found at the Abbey of Montevergine in Italy. Artistically speaking, it is very difficult to satisfactorily compose an image of two persons together, but the many icons of the Virgin and Divine Child Jesus, such as this one, are supremely admirable for doing so in a pleasing manner. So great is the authority that mothers possess over their sons, that even if they are monarchs, and have absolute dominion over every person in their kingdom, yet never can mothers become the subjects of their sons. It is true that Jesus now in Heaven sits at the right of the Father, enjoying that distinction even as Man because of the hypostatic union with the Person of the Divine Word. He has supreme dominion over all and also over Mary; nevertheless, it can always be said that for a time at least, when He was living in this world, He was pleased to humble himself and be subject to Mary. Says St. Ambrose, Jesus Christ having deigned to make Mary His Mother, inasmuch as He was her Son, He was truly obliged to obey her. And for this reason, says Richard of St. Laurence, "Of other Saints we say that they are with God; but of Mary alone can it be said that she was so far favored as to be not only herself submissive to the will of God, but even that God was subject to her will. Therefore we say that, even though Mary can no longer command her Son, since they are not on earth any more, still her prayers are always the prayers of a Mother and are therefore most powerful in obtaining whatever she asks. Mater de Perpetuo Succursu, ora pro nobis! "the photo that moved me"